At least four, possibly five, people were killed when a mortar shell scored a direct hit on a group of soldiers in the Eshkol region Monday afternoon. Four other people were seriously injured. The injured were taken to hospitals in Beersheva and Ashkelon, Voice of Israel public radio said. In a separate incident, terrorists breached the border from Gaza near Kibbutz Nahal Oz, Channel 2 reported Monday evening. One was killed and the others escaped. The house was hit in a major round of rocket firing Monday afternoon, as the last vestiges of what was supposed to be a 24-hour truce evaporated. By 6 p.m., Hamas had fired nearly two dozen rockets at Israel, most of them in the late afternoon. Iron Dome missiles shot down two rockets, one over Ashkelon and one over Sderot. In light of the rocket fire, IDF forces began shelling Hamas targets in Gaza. 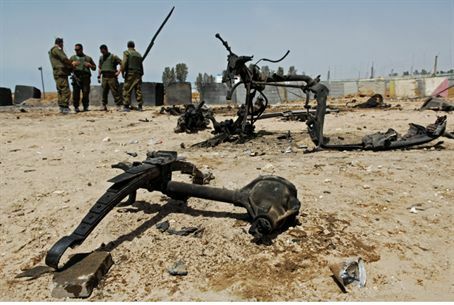 Gaza officials said that at least people had been killed in an IDF strike on a park in the Shati refugee camp. Hamas said many of those killed were children who were playing in the park. The IDF has not commented on the report. Gaza groups also said that the IDF had struck a building on the grounds of Shifa Hospital in Gaza City. The IDF denied this, saying that it had not been operating in the area during the time. An IDF official said that if the building was hit, it may have been by an errant Hamas rocket fired at Israel that went off course. The official said that four such rockets had fallen inside Gaza on Monday.